Sept. 19, 2012, 10 a.m. Handed an opportunity by the closure of the Ann Arbor News, two married journalists have built a small business on the kind of civic-minded reporting that isn’t supposed to work online. By Michael Andersen @andersem Sept. 19, 2012, 10 a.m.
For four years, Mary Morgan and Dave Askins have been the change David Simon was waiting for. 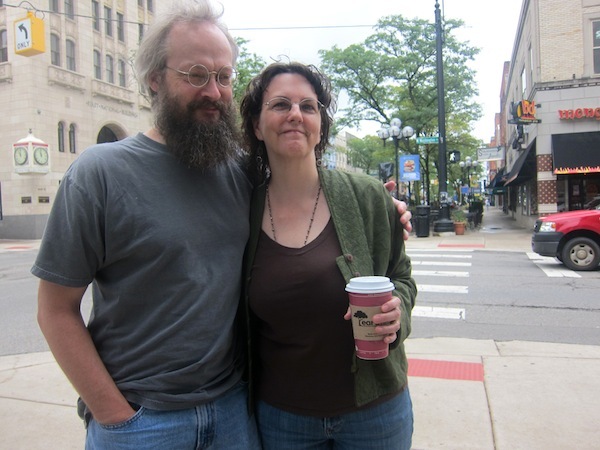 The married couple’s website, the Ann Arbor Chronicle, doesn’t just cover the planning commission, as the Wire creator once suggested bloggers never would; it covers the taxicab board. It doesn’t just publish local election results; it publishes fact-checked 13,482-word summaries of the fifth-ward city council candidate forum, 10 days after the event took place. Morgan, Askins, and seven paid freelancers contribute. On a busy day, the Chronicle posts three stories; on a slow day, it posts nothing. It’s one of the oddest local-news startups in the country, and one of the most idealistic. It’s also, Morgan and Askins say, bringing in $100,000 a year and growing by 16 percent annually. When we last caught up with the Chronicle, in 2009, this Michigan college town of 114,000 had just lost its only daily newspaper. Advance Publications had folded its Ann Arbor News, dismissed 55 employees, and replaced the company with AnnArbor.com, a high-volume news website that publishes a print edition on Thursdays and Sundays. For news entrepreneurs looking to follow in the Chronicle’s footsteps, here’s some wisdom from four years of shoe leather. 1. Small ad sales just aren’t worth the hassle. “When we launched, I was naively thinking that the small-pebbles-to-large-boulders approach would be better,” Morgan, who acts as publisher and handles all ad sales, told me. At launch, the Chronicle’s cheapest ad position sold for just $100 a month — and though Morgan managed to singlehandedly juggle 111 separate ad accounts in 2009, she soon realized she was wasting her time. “It takes a lot of hand-holding to sell maybe a small ad once to a small business to whom that $100 is very important,” said Morgan. So in 2011, she doubled their ad rates and targeted “larger institutions [for whom] spending five, six thousand dollars with us is like a pittance in their overall plan”: Zingerman’s Deli, Ann Arbor State Bank, the University of Michigan. 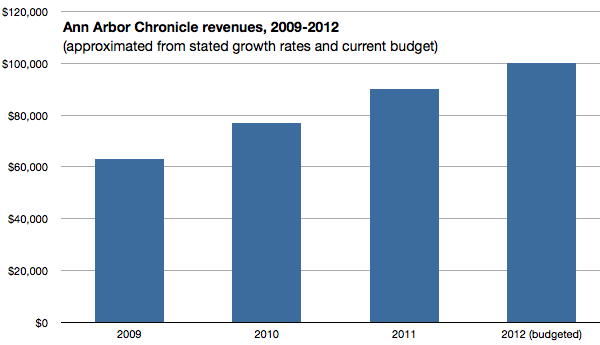 The number of different Chronicle advertisers plummeted to 46 last year, according to the site. But the higher prices kept ad revenue steady — and Morgan saved a lot of sales calls. 2. You don’t need a paywall to get substantial reader contributions. It didn’t bring in $4,000 in new donations, they said. But Askins expects they’ll do another mailing someday, because he thinks it retains their existing donors and proves to their fans that they’re making efforts to grow. 3. Exclusive events pay off. Morgan and Askins haven’t considered offering premium content to subscribers; their pitch to donors, after all, is that support for the Chronicle is “a gift to the community.” Instead, the main benefit of Chronicle membership is an invitation to its annual Bezonki Awards — a civic-recognition affair that, this summer, featured free appetizers, a cash bar, a set of custom cocktails including the “ink-stained wretch,” and, for old time’s sake, a filing cabinet containing a bottle of scotch. Morgan is also dreaming of inviting Chronicle groupies to join them at a local bar for a Mystery Science Theater-style viewing of a televised city council hearing. “There are people who would do that,” she said. 4. Don’t pull punches against the competition. Morgan, a former business editor for the News whose fashion trademark is a pair of typewriter-key earrings, said her ad sales pitch never includes attacks on AnnArbor.com. But when the subject came up in our interview, Morgan didn’t mince words. “What’s happened here is clearly a train wreck in terms of journalistic integrity, ability to cover the community,” Morgan said. The site’s new staff is dominated by non-locals who are “a couple years out of college, maybe,” Morgan said. In the time a single Chronicle freelancer was covering public schools, she said, AnnArbor.com cycled through three different beat reporters. “In a university town, you’re going to have some young reporters,” Morgan acknowledged. “But for God sakes, you’re going to have some veterans who will be able to say, ‘Wait a minute, that’s not the name of the street, or you know, that person a year ago was embezzling. 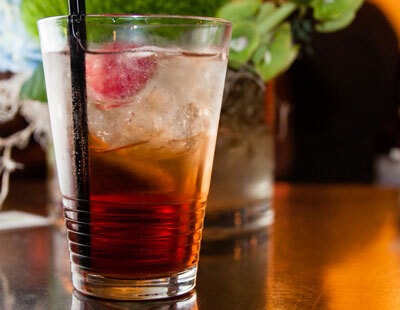 '” AnnArbor.com has lost its institutional knowledge, Morgan said, and the town is suffering. In their characteristically massive columns dissecting AnnArbor.com, she and Askins risk coming off as cranks. But it’s obvious that they’re not the only Ann Arborites dismayed by the reduced quality of Advance’s operation, even as the company reports a high digital share of the local audience. And it’s just as obvious that public resentment of Advance’s cutbacks is important to the Chronicle’s business model. Morgan and Askins are eager to note that the Chronicle’s content model — governance without politics, simplicity without brevity — is unusual. The local news business needs more strange ideas, Morgan says. But what if that’s simply because spot news is what readers want? In Ann Arbor, at least, readers seem to want deeply informed procedural reporting, too — Morgan and Askins have the modest lifestyle to prove it. And as they focus on drumming up enough subscriptions to hire more freelancers, they’re hoping for a breakthrough in voluntary support. POSTED Sept. 19, 2012, 10 a.m.
Andersen, Michael. 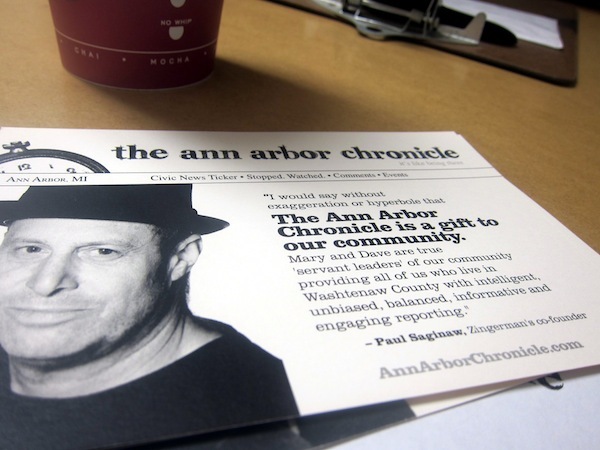 "Four years later, the Ann Arbor Chronicle is still weird and wonky — and it’s growing." Nieman Journalism Lab. Nieman Foundation for Journalism at Harvard, 19 Sep. 2012. Web. 20 Apr. 2019. Andersen, Michael. 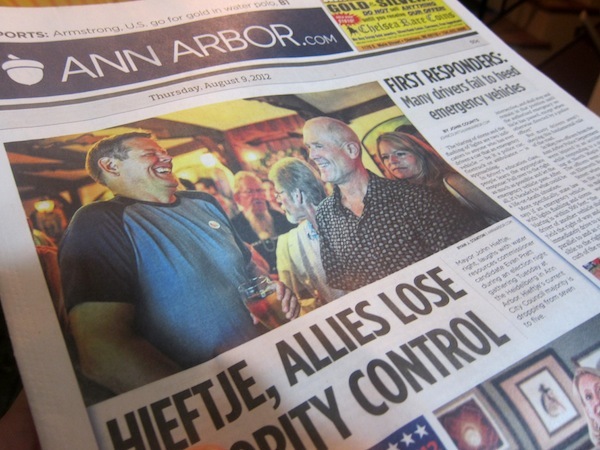 "Four years later, the Ann Arbor Chronicle is still weird and wonky — and it’s growing." Nieman Journalism Lab. Last modified September 19, 2012. Accessed April 20, 2019. https://www.niemanlab.org/2012/09/four-years-later-the-ann-arbor-chronicle-is-still-weird-and-wonky-and-its-growing/.